​There have been moments of life when I have felt totally alone. When there hasn’t been one person who has been on my side. I know that sounds really depressing, but if we are honest, we have all been there. However, in those moments, God has reminded me that He is always with me – and that I can walk with him. 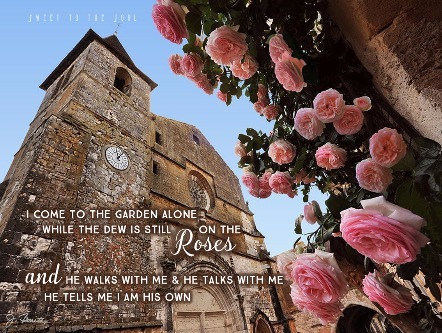 As a little girl, I always loved the hymn “In the Garden” . I always pictured myself in the Garden of Eden, walking in a perfect world. I would day dream about being able to walk with God – not just through my daily time in the Word and Prayer, but actually walking with God. I pictured him like I did my daddy – strong and sure and holding my hand. But, I didn’t feel like that was what was actually happening. I felt alone, and sometimes, I felt as if God wasn’t really with me. As I matured in my walk with Lord, I began to learn that my garden time was my quiet time- and it was beautiful. There, He walks with me. Through words of scripture He talks to me – and tells me I am his own. We share joy – and the joy is like none other I have ever known. It is intimate, it is personal, and it is mine. That personal relationship with Jesus is my lifeline, it is my everything. Just like the love relationship with my spouse, I need that time to truly be alone and intimate with him. Since making this time a priority, that lonely feeling doesn’t haunt me as much. I know that my Heavenly Love will always be there, waiting for me. I just have to come to the Garden. ​Mandy Kelly is passionate about two things: The Word of God and the Souls of Men (and Ladies!). She is a married to her best friend, and gets the privilege to love on their three blessings (who lost their biological momma leaving her husband widowed).She loves that the Lord has let her life be an example of delighting in Him and watching Him mold her life to make her desires match His. 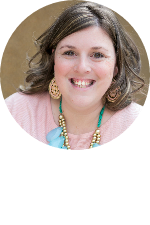 She spent 9 years in an early childhood classroom, and 4 years in an “in house” seminary program at her home church.She loves to bring God glory through her roles as Christ-follower, Wife and Mother (in that order!) She enjoys women’s ministry, cooking, crafting, and traveling the world. Mandy is also passionate about Adoption and helping women with Infertility- as both are areas God has trusted her with. Her greatest desires are to have her marriage bring God ultimate glory, see her children walk in truth, to lead others to the feet of Jesus, and to lead women into deeper and intimate relationship with their Savior through study of the Word of God. Mandy, I needed to hear this today -- thank you for sharing! Mandy - i don't think i would be alive today if not for the music!! - i was raised on traditional hymns - piano, organ, choir - countless times, a song has come to mind just when my heart seems broken beyond measure - "Heaven Came Down" is a sweet favorite, sung at dear friend's funeral - "In The Garden" is another favorite - one day i found myself humming "Holy, Holy, Holy" all day at work - "The Woman at the Well" identifies in my life - but - i'm writing to share particularly "Because He Lives" - i had not been in church for quite awhile - separated from my husband, i'd spent the weekend with a dear friend and her mother insisted we attend church that sunday (easter 1985) - as we sang this song, i cried, thinking about my circumstances - little did i know that the following day, i would receive a phone call from my mother informing me that my baby brother had been in a terrible ATV accident, sustained a traumatic brain injury and was on life support - as i flew home, the words to this song came to me again and i wept knowing that i didn't know what the future held, but, I KNEW WHO HELD THE FUTURE - my faith was strengthened and this came to be foundation that i stand on to this day! !